My Home and Garden: Zucchini...holy crap!! I have had a vegetable garden since 2011 which means this is my fifth season. In that time, I have been trying to grow zucchini every year. Yes...TRYING to grow zucchini. 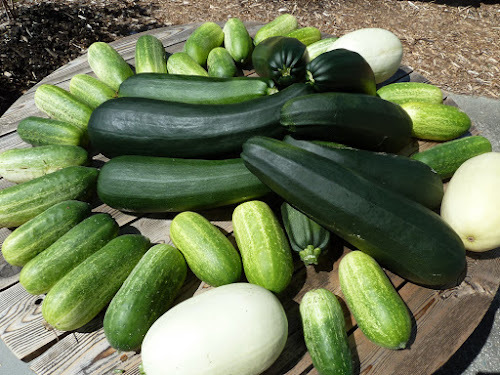 In August 2013 I got a large and a small zucchini. This is the big one. This was it. 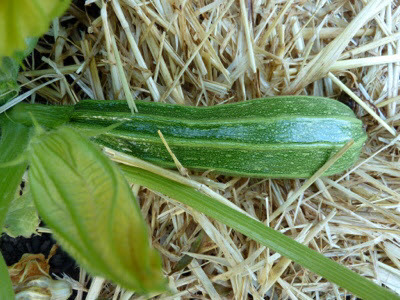 The only zucchini in five years. Fast forward to 2015 and the new Back to Eden garden. The largest zucchini in this picture is two feet long. Some of the cukes are about 10". I am stunned by this. Surely those zucchini are TOO big, aren't they? They look more like marrows! Would it not have been better to pick them young and tender? Looks like you need to make some pickled cucumbers too. They are absolutely too big. :-) Isn't it amazing. We are so used to nothing growing, we got caught off guard and without a harvest plan at all. Then it got overwhelming. So we've cut all the huge ones off and grind some up for cakes and freeze it, and start again. Wow, quite the crop. I've actually got 3 small zucchini growing, last year they all dropped off, but fingers crossed they will be edible this year.